At Silk Bedding Direct we are so confident that you will absolutely love our mulberry silk-filled bedding that we provide you with a worldwide 14 days “no quibble” guarantee. 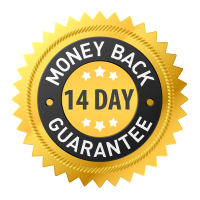 This allows you to return goods to us within 14 days of receiving them and we will refund all monies paid including the shipping costs. We'll even pay the return shipping costs too. Total refund, plus return shipping paid - you pay absolutely nothing. This guarantee is in addition to your statutory rights, which remain unaffected. All bedding is OEKO-TEX Standard 100 certified and passes through a rigorous two stage quality control process prior to being dispatched to customers. At Silk Bedding Direct we go that extra mile to make truly exceptional, top of its class, luxury mulberry silk-filled bedding - the very best bedding that money can buy. We promise you won't be disappointed! Silk Bedding Direct is a UK company. Silk bedding orders are dispatched from the UK on the same or next day of ordering. Worldwide delivery options available at checkout. Click on the bed size below to see the range of wonderful mulberry silk-filled bedding in that size.